Oat milk is becoming a very popular alternative to dairy milks, and is wonderfully nut-free. It’s so easy to make at home and is very inexpensive. You don’t need a fancy milk-maker (yes, these do exist), just a blender, a jar, a jelly bag, and some patience. Get my recipe for super simple, super easy, creamy oat milk HERE. If you do not have time to make your own oat milk, use an allergy safe brand from the grocery store. My recipe for oat milk latte ice cream is light as air and delicately flavored with coffee, honey, vanilla, and chocolate. Close your eyes and you’ll feel like you’re sitting by the sea in the Mediterranean. 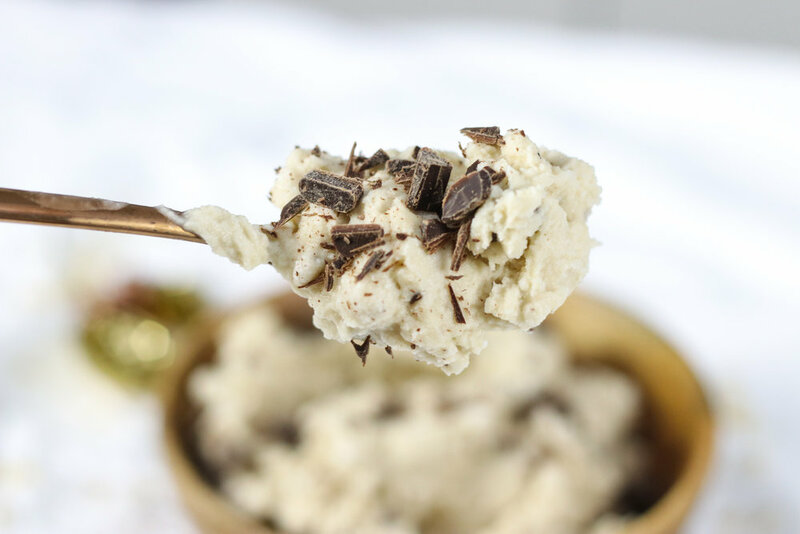 This is one of my all time favorite dairy-free ice cream recipes to make at home. Whisk all the ingredients together and pour into the ice cream maker. Churn for 25 - 30 minutes, or until thick and creamy. Serve immediately. Add extra chocolate shavings for garnish. If you’re in the mood for something even lighter and airier than my oat milk latte ice cream, try my oat milk granita affogato. A granita is an icier version of sorbet that is typically scraped from a block of frozen fruit puree. I never have the patience to do that, so I just use an ice cream maker to achieve the same consistency which works here because of the texture and low fat content of the oat milk. Affogato refers to pouring an espresso over vanilla ice cream, a very common Italian dessert. To enhance the coffee flavor I have also added some instant coffee to the granita. This recipe showcases the earthy, nutty flavor of the oats. Whisk all the ingredients together and pour into the ice cream maker. Churn for 25 - 30 minutes, or until thick and creamy. Spoon into 4 bowls and pour the cold espresso or instant coffee powder on top. Serve immediately.